A total of 125 accessions of one-flowered vetch (Vicia articulata Hornem.) mostly from the Iberian Peninsula have been analysed for total protein, L-canavanine and condensed tannins. 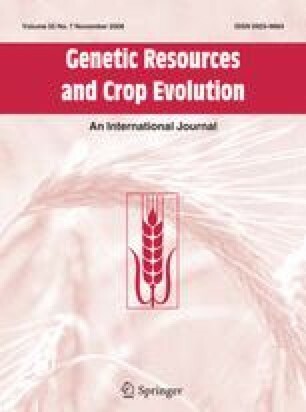 It was observed a high variability in the composition: the protein content ranged from 18.20 to 30.07%, L-canavanine from 0.27 to 0.67%, and condensed tannins from 0.13 to 0.35%, which indicates a scarce domestication of the crop. The inclusion of the seeds into a diet to non-ruminants should be limited to marginal percentages because of the contents of L-canavanine and it suggests that a reduction of this compound by breeding should be encouraged. The protein and the L-canavanine contents showed a low and positive significant correlation (r = 0.55, P < 0.001), which complicates the selection of seeds having simultaneously low L-canavanine and high protein contents. On the other hand, no correlation between protein and condensed tannins or between L-canavanine and condensed tannins was observed. There was a poor relationship between the origin and the composition of the accessions and only the protein content was able to discriminate among the regions. This study is a part of the projects 03-213/CH-61 and 06-314/CH-96, which are funded by the Consejería de Agricultura, Junta de Comunidades de Castilla—La Mancha. The authors are in debt to the Banco de Germoplasma Vegetal de Cuenca, BGV-Cuenca (Cuenca, Spain), Centro de Recursos Fitogenéticos, CRF (Madrid, Spain), Instituto Tecnológico Agrario de Castilla y León, ITACyL (Valladolid, Spain), Washington Regional Plant Introduction Station, WRPIS (Washington, USA) and Leibniz – Institute of Plant Genetics and Crop Plant Research, IPK (Gatersleben, Germany) for supplying the plant material. We are grateful to N. Cardo Maeso and R. Lozano Sáez for providing technical assistance.